Stitch Fix arrival day is always a mixture of giddy nervousness when I pull into my driveway and see my Stitch Fix box by the front door. This time was no different! I decided to wait until after the kids went to bed to open my box and it about did me in! By the time I opened my box, I was like a toddler waiting to dig in to their piece of birthday cake, 2 kids too long! At first glance it was love at first sight at the mixture of patterns and colors! Find out if the try on was just as much of a love fest or a bit bittersweet below. I’ve had a black and white gingham check top on my wishlist this winter to layer under cargo vests, faux fur vests, etc. 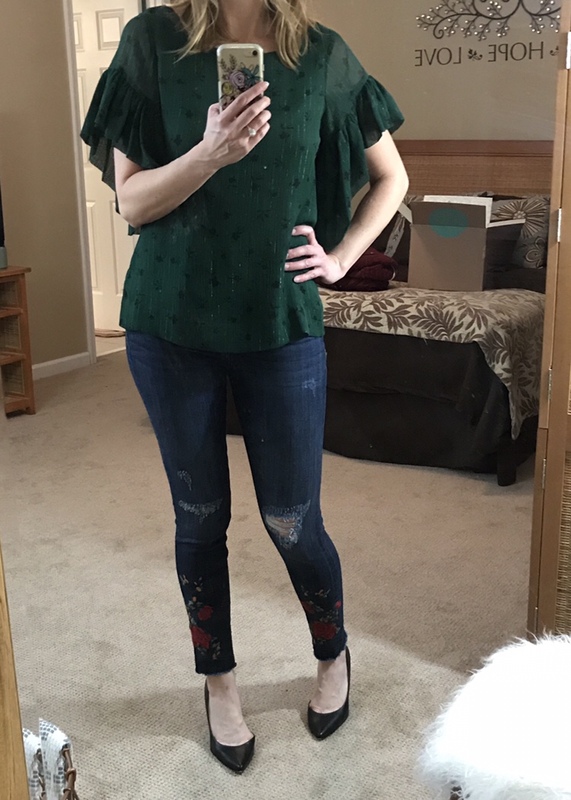 So far, I haven’t found one that doesn’t make me feel like a lumberjack so I was hopeful that the lace up detail on this one would solve for that! Unfortunately, I just don’t think plaid and check are my jam… I still feel like a lumberjack in it despite the lace up. The colors and pattern of this infinity scarf are absolute perfection! I loved it so much so that I already have a very similar version of it from Stella & Dot. Unfortunately, that means back it goes since I don’t need duplicates of anything as I prepare to move this month! When I first saw this I loved everything about it… the sleeves, the pattern, the color, the subtle metallic thread running throughout! Everything! Except the price that is but I decided if I kept everything it might be worth the splurge. Alas, as I looked in the mirror, I didn’t love the top on me. My broadest part are my shoulders and bust and where the flutter sleeve hit, it just wasn’t as flattering as I’d have liked for $88 so back it goes (sad face:( ). First let me say this coat is an absolute dream! It fits to perfection and is warm and cozy without making you look like the Stay Puffed Marshmallow Man! The color adds a bit of warmth to the usually dreary winter color palettes. 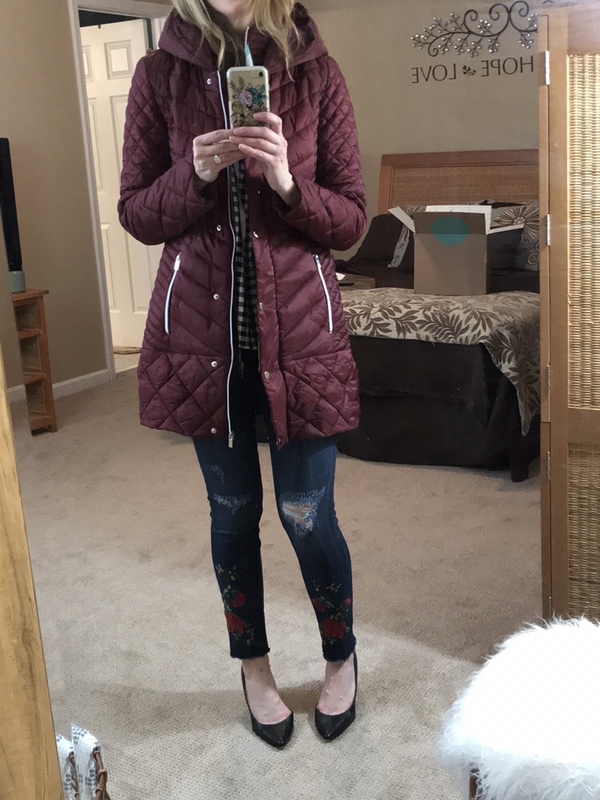 The zippers and patterned detailing give the coat a feminine silhouette despite the “puff.” But… with planning a wedding and a move in the next month, I just couldn’t justify spending over $100 on a coat when cold temps in Atlanta will be ending in the next few weeks (hopefully). As much as this one pains me, back it goes (sometimes being a responsible adult is no fun!). I was really excited when I pulled these out of the box … if there’s anything I love more than distressed denim, it’s distressed denim with embroidery! 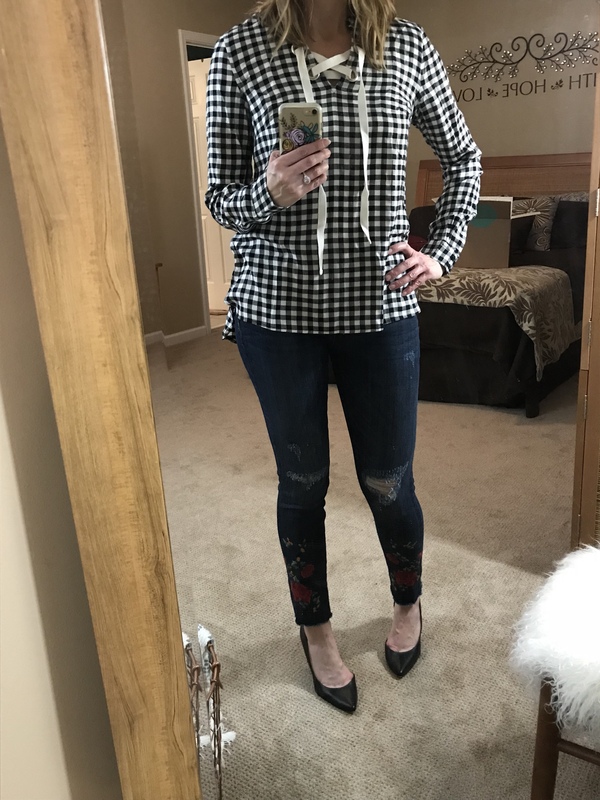 Fashion denim with stripes, polka dots, embroidered floral patterns, paint splatters and more are going to be big this spring so I was excited to get a jump on the trend thanks to my Stitch Fix stylist. Overall, this fix was amazing in color, pattern and pushing me a bit out of my comfort zone. On look alone, I absolutely wanted to keep everything! Unfortunately budget and fit on a couple of items necessitated being a bit more selective! I’m still having “returner’s” remorse over that coat and green blouse! As usual, I already can’t wait until my next fix!